The Brain Training series has been big business for Nintendo, and has therefore seen rival titles emerge to compete for our brain time. The latest to enter the fray is Square Enix — collaborating with IQ specialists Mensa — to try and help us make the most of our grey matter. Mensa Academy is set to arrive in Europe and PAL regions on 27th July, with 3DS and Wii listed as platforms along with a number of others: no announcement yet on a North American release. It sounds very similar to the Nintendo-published series, and is likely to find an audience among those that enjoyed the DS titles. Maybe the visual exercises will be easier with three dimensions to look at. London (May 30th, 2012) – Square Enix Ltd., the publisher of SQUARE ENIX® interactive entertainment products and Barnstorm Games, today announce Mensa Academy, a new brain training game that will give players the ultimate grey matter workout.. Mensa Academy will be available from July 27th 2012 in the United Kingdom, Scandinavia and PAL regions for Nintendo® Wii™ and 3DS™, Windows PC platforms, Smartphones and in the near future for HD consoles, Android and iOS. 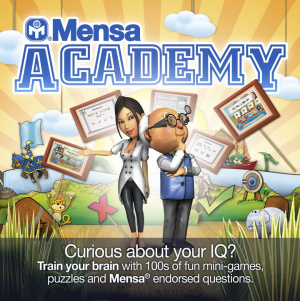 Created in collaboration with Mensa, Mensa Academy offers players the ability to determine and improve their score in Play, Coach and Test modes. Play mode challenges players to take on 100+ replayable levels in five disciplines— Numeracy, Language, Logic, Memory, and Visual, packed with questions. For further training, players can use Coach mode to hone their abilities and assess their progress in key disciplines before taking their skills to the next level in taking the Test and discovering their Mensa Academy score; will all that brain training have paid off? For more information about Mensa Academy, visit http://www.mensaacademy.com. Mensa Academy is developed by Silverball Studios and Barnstorm Games and published by Square Enix Europe. Is it just me, or does the guy on the right looks like Dr. Bunsen Honeydew? @Leon- Yeah. It also looks like P.Elvin Gadd. Why is SE releasing all of their games in the next two months ? That sounds so mean in spanish. Brain age ripoff. I'll just stick to demon training when it comes out in North america. I always thought MENSA was for the US only. So does that mean Menso means dumb boy?